Our range of products include fruits and vegetable cold store and cold storage plant. We are offering Fruits and Vegetable Cold Store to our clients. We provide high-quality products to our customers. First among the best, we provide clients with the superior quality of Cold Storage Plant. 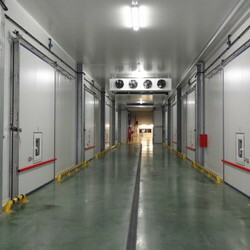 Used for storage of products under controlled environment, the cold storage plant is known for its thermal stability, low maintenance and robust construction. Our customers can avail the cold storage plant in various specifications.